Welcome to Mountainside Cabins, Hot Springs, North Carolina, "your place to unplug". The new owners Ken and Amy are looking forward to welcoming you to the area. We offer a sense of nature and tranquility in the beautiful and serene Appalachians. Our family-owned country-style cabins are fully equipped with anything you may need for your stay. A place to unwind and breathe fresh mountain air while taking in the breath-taking views. Lose all sense of time and responsibility as you venture out into the historic quaint downtown area of Hot Springs (located just down the mountain five miles away), enjoying the world famous natural hot mineral spas or spend the days exploring the great outdoors. The Appalachian Trail runs right through downtown. For the adventurous type, there are many outdoor activities in the area including: horseback riding, zip lining, whitewater rafting/tubing/kayaking down the French Broad River, discovering the many waterfalls in the surrounding areas and hiking the numerous trails of the Appalachians. 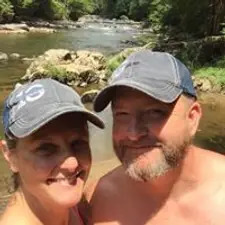 For a more relaxing vacation, spend a quiet day fishing on the French Broad with beautiful mountains as your back-drop or spend the day shopping in the eclectic city of Asheville (located just 40 miles away). Discover all the many wild plants, trees and animals that are native to the Appalachians. Our cabins are spacious and private, sleeping between two and six people. Each cabin has its own private picnic area with fire pit, picnic table and outdoor grill, and though very private, the owners live on site and are happy to assist you. Mountainside Cabins is a wonderful vacation spot for families, couples, singles, or groups. You will fall in love with our rustic cabins and make many memories here in Hot Springs. Please call for more information - 828-622-7647 or 828-206-0598. Children and dog friendly!